A great opportunity to own a beautiful, well kept and maintained home in the heart of Lake Mary in The Crossings! 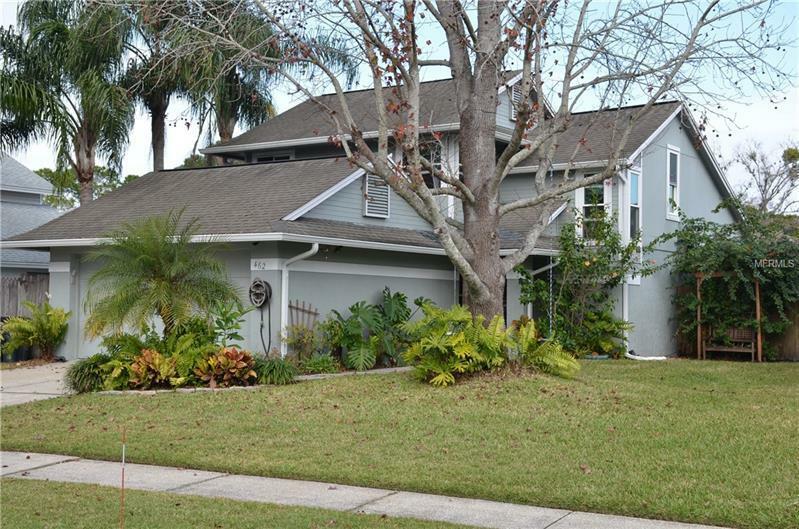 This three bedroom, three bath home sits on a small pond, offering a quiet tranquil setting. This home was totally remodeled and improved back in 2011. Exterior is a two story home with concrete block and stucco construction on the first floor, wood on the second. Two bedrooms downstairs (split plan) plus a living room with fireplace, family room overlooking the pond and a combination dining room and kitchen. The kitchen was totally remodeled including new appliances, top end granite countertops and a walk in closet pantry. The entire home has new energy efficient windows throughout. Two car garage with opener. The home also has a security system with some cameras that will be left for the new owners. Upstairs is the master bedroom with a large dual sink bath. Master also has a walk in California designed closet system...perfect for your clothes and stuff! Also upstairs is a separate utility closet with a washer, dryer and shelving. The home has a small loft and there is a cathedral ceiling offering a spacious feel to the beautiful home. This home sits in an excellent location! Fantastic schools and community. Lake Mary made the #4 city for quality of life and places to live in the US a few years ago! This home is move in ready and will exceed your expectations! Come take a look! Pet Restrictions: Review HOA docs for additional information.